Luxury 2 Bdrm with Fabulous Lake Views and Gorgeous Pool! Private Wi-fi! 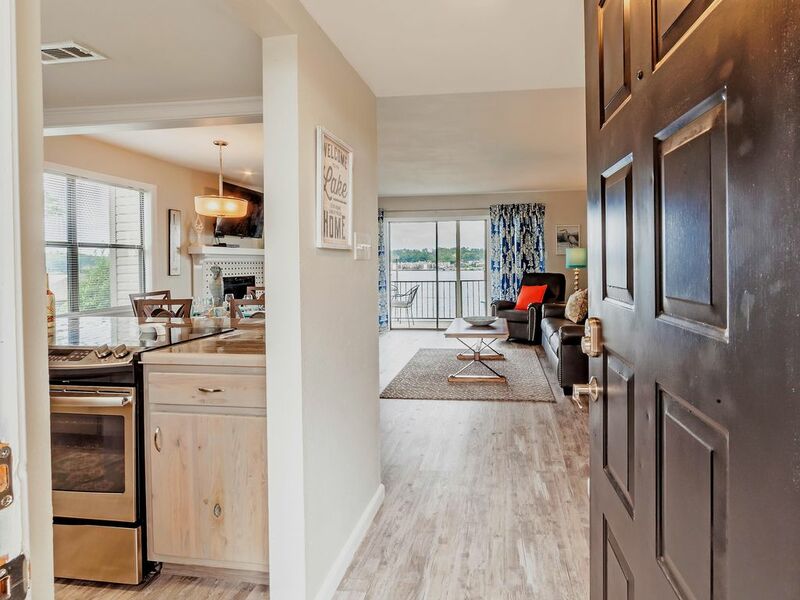 This newly remodeled 2 Bedroom/2 Bath condo sits on Lake Hamilton and is centrally located on 7 South with fabulous views of the lake from your balcony. This walk-in unit has just been completely remodeled and has new furnishings including 2 King size beds and a Queen size pull-out sofa. The pool and tennis courts are located right outside your front door! You are within walking distance of several restaurants and marinas where you may rent boats or water toys! Come to Hot Springs and make memories. Make this unit your home away from home in Hot Springs! Enjoy free Private Wifi, gorgeous views, amazing sunsets and relaxation in this gem! Our family has been happy to call Hot Springs home since 2005. We have grown to love the beauty and adventure that Hot Springs and Arkansas, the Natural State, has to offer. This property is centrally located on 7 South and is within a 1-10 miles of great restaurants, marinas, outdoor fun and gaming. The condo provides all of the benefits of home and is so much more convenient than hotels. This location is quiet with lovely lake views; fish from the dock area or lounge in the pool. You are within walking distance to marinas and restaurants/bars too. Historic Hot Springs Bath House Row offers quaint shopping and bathhouse experience with Hot Spring water and spa experiences. Enjoy Oaklawn Park Live Racing(in season) and year round gaming. Sheets, blankets, pillows and bedding provided on King beds and for Queen sleeper sofa. Full, well appointed kitchen. New stainless electric stove/oven and dishwasher. Garbage disposal and stainless refrigerator/freezer. Enjoy all of the adventure and excitement Hot Springs has to offer including, historic downtown Hot Springs Bath House Row, hiking, lake fun and more! This unit has great views of Lake Hamilton. The decor is beautiful with light colors. The beds are very comfortable and we had plenty of room in the unit. Kitchen is fully stocked for cooking. The balcony has great seating and quiet when you are just wanting to relax with a cup of coffee or a cocktail. We enjoyed the property amenities too. I would definitely recommend this condo to friends and family. Thank you Kim! Please come back and stay with us again in the near future! Gorgeous condo on Lake Hamilton! We loved this gorgeous condo! It is decorated so well and spotlessly clean. We were close enough to walk to a few restaurants and enjoyed fishing from the docks. We really enjoyed the outdoor grilling area too! This was my favorite rental ever! Thank you for the lovely review! We are so pleased that you enjoyed your stay and look forward to future visits! What an awesome condo right on Lake Hamilton. Everything was just perfect from the décor to the awesome views of the lake, especially the sun coming up in the morning! Hopefully we will get the chance to stay here again next time we visit Hot Springs! Thank you Bonita! We are so glad that you enjoyed your stay with us! Please come back soon! The condo was very tastefully furnished, but still very comfortable. This place is my favorite rental yet! Thank you for the kind review Julie! We are thrilled that you enjoyed your stay! Please come back and stay with us again! Fabulous apartment with a lovely view! The apartment is beautifully decorated with everything you could possibly need. Great parking, great view and spotlessly clean. I would absolutely recommend this accommodation to anyone. I booked this from Sydney Australia and it was better than my expectations! The owner was very quick to respond and gave us all the information we needed for our stay. Loved it! Thank you so much for staying with us Janette! We are thrilled that you enjoyed the condo and your stay in Hot Springs! It was a pleasure! Please come back and stay with us again in the future! This is our second time here and we love it! This is a beautiful condo with a beautiful view! It’s so cozy and warm! We will definitely be back! Thank you for the lovely review and for coming back to stay with us for the second time! We look forward to your next visit! Stroll through Historic Hot Springs downtown area, enjoying bath house row, shopping, and dining. Visit Magic Springs and Crystal Falls for a day of amusement park and water park fun. Watch live horse racing from the middle of January to the middle of April and enjoy gaming and off track run year round at Oaklawn Park. Play on Lake Hamilton or just enjoy the fabulous view and sunsets from the balcony of your lovely condo with all of the comforts of home.